When you lose or have your device stolen, Who's Looking can help you locate the device with using Cloud Locate to send action codes to the device. To use Cloud Locate, you first need to register from your device with the Who's Looking app. Open location link from email to see devices location in google maps and use the pictures to help determine location at that point. Send the action code to have device email you its location along with pictures of the location. With failed unlock photo feature you may also have the picture of the thief you can provide the police. Contact your local police and inform them of the location of your device and provide them the pictures. 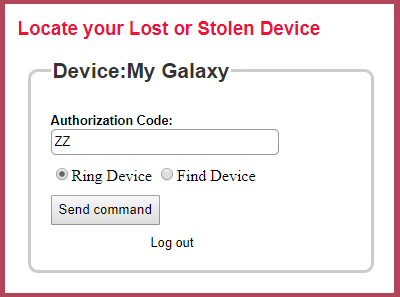 Send your authorization code plus action code to your lost mobile device. Example: If your authorization code is ZZ. Then enter the following to remotely ring your device. Ring - Will ring device with a loud siren even if device was left on mute. Find - Will have the device email you its location and pictures of the location using the front and back camera.